In less than 30 days, we will be moving to a new town 600 miles away. I am SO excited! (Can it be today? Please?! I’ll leave all of my wordly possessions behind if you just let me move today!) And, because of this move, I will be starting a new blog series! 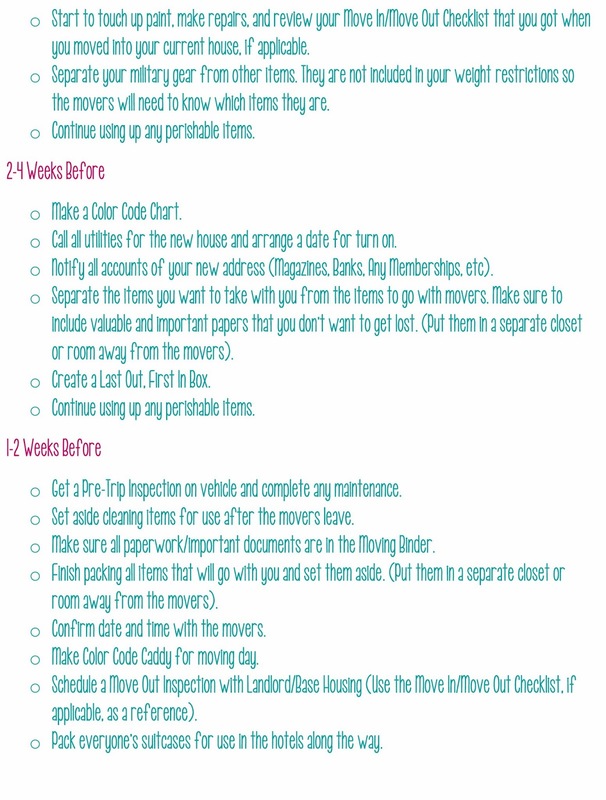 I thought it would be the perfect opportunity to share how I organize our moves! Being in the military, moving is just kind of part of the package. We have moved a total of 4 times in 3 years (though sometimes not at the same time). All of that moving means that I have had lots of practice and I think I have finally perfected our moving system. The first step to organizing your move is to create a checklist. 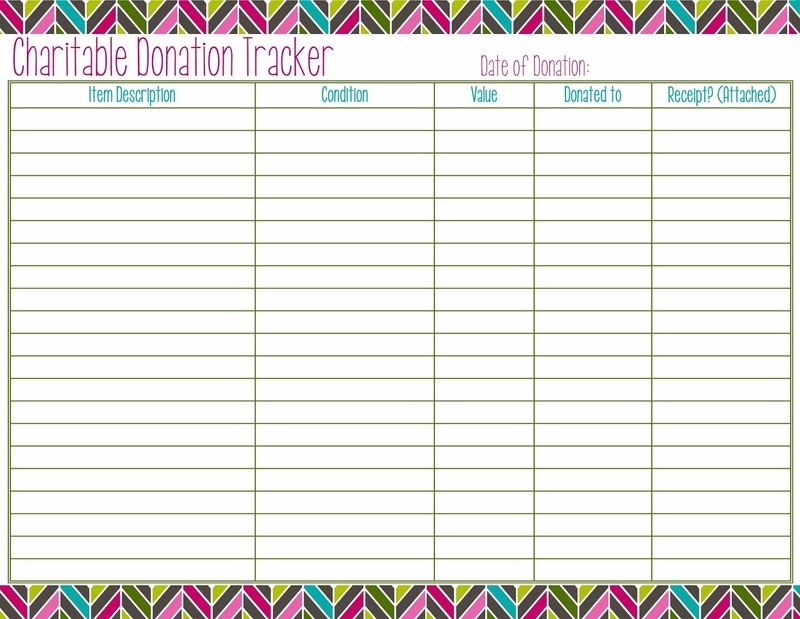 You can download this printable for free and use it for your move. I’ve made it for a PCS (Permanent Change of Station) Move, but even if you aren’t in the military, this checklist will still work for you. Click Here for this Printable. I haven't had to move a lot, but if I did–this would be very helpful. I hope we don't have to move in a long time as we have way too many books and other stuff–and we have never been able to have movers. We've had to do it ourself. 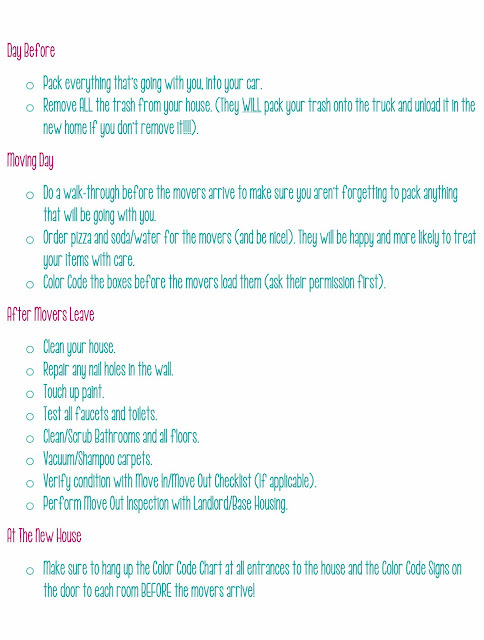 This would be extremely helpful (and not to mention cute) for families who move often. Me, I've moved enough in my lifetime and you'll have to move me kicking and sceaming the next time! We've moved twice in the last 3 years due to job transfers. We did the first one ourselves, but the last with movers. I'll never move any other way again. Your list is extremely helpful. We'll hopefully be moving again soon, so I'll make sure to pin this to have it handy. This is amazing! Great job on this! I will have to pin this for later because if things work out right, next summer we should be moving too! Good luck on your move! Wow, this will come in so handy! I'm married to a real estate developer, who builds houses that we move in to, sell them, and of course have to move. I've moved 5 times in 2 years, and I'm still not good at moving. Can't wait to use this for the next move! XO! Wow..that is quite a list you compiled together! We have moved 5 times in 5 and 1/2 years of marriage! Now we are settled in our home! I am sure we did many of the stuff you wrote down without even realizing it. Thank you. We are only 15 weeks from our next move. This is awesome! 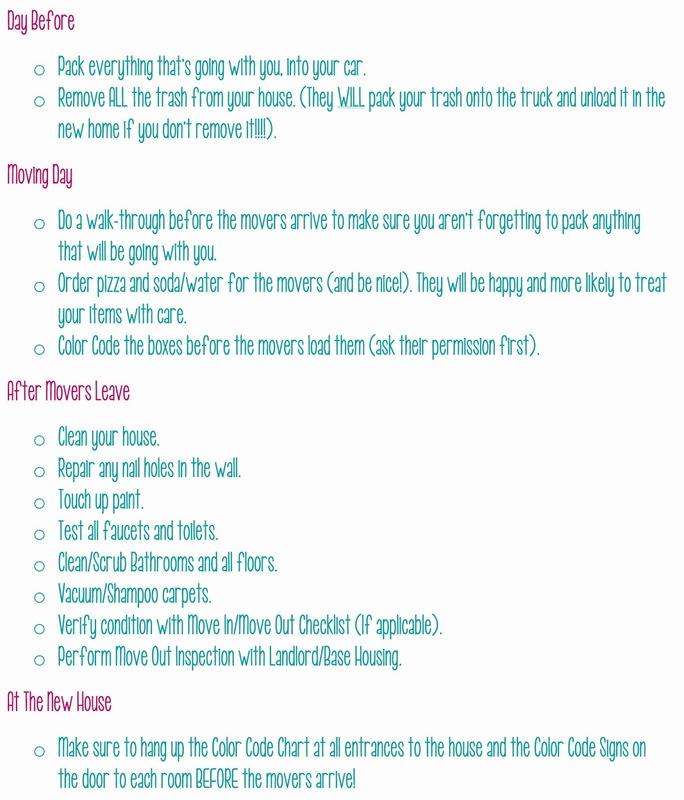 We are going to move to our new place in a month so this list couldn't have come at a better time! Did you all have to move for your job? I know. I've moved both with and without movers and now the thought of not having them is daunting! We are so lucky to be able to have them!! Wow girl, you really did some researching. I love this info Miranda, you make me feel like moving all over again just to put all the steps which i missed out into place. Great article, I am sure u took a lot of time to gather all those info. And its true we should have a checklist when it comes to moving. A friend of mines told me of A-1 Moving & Storage and the professional services these guys offer. Between work and my family, I didn't had the time to pack my stuff and hearing about a company who is willing to do the task for you was a relief for me. And the expense was not beyond what i thought it would be. So I am very satisfied with the services I received and I would recommend them to others. They are also known for providing exceptional storage facilities, check out more at http://www.jupiter-movers.net/local.cfm or give them call today (561) 625-0600. Just googled PCS move and found your post…what do you mean by color chart and what do you use( dots, markings, etc). For my color chart I just assign a different colored sticker to each room (for example: All boxes that will go to my son's room get a green sticker. Anything going to the kitchen gets a red sticker, etc.) then, when we get to the new place I put a paper on the door saying which color sticker goes in that room. It just makes it easier when you move in. The movers can see which room the box goes in so you don't have to run after each of them telling them where everything goes. For my stickers, I just use the color coding stickers like this (http://www.amazon.com/gp/product/B000BMBU9C/ref=as_li_tl?ie=UTF8&camp=1789&creative=390957&creativeASIN=B000BMBU9C&linkCode=as2&tag=thbubebl-20&linkId=D23AF6BIRFKCKOK5) You can find them at just about any store in the office supplies section. 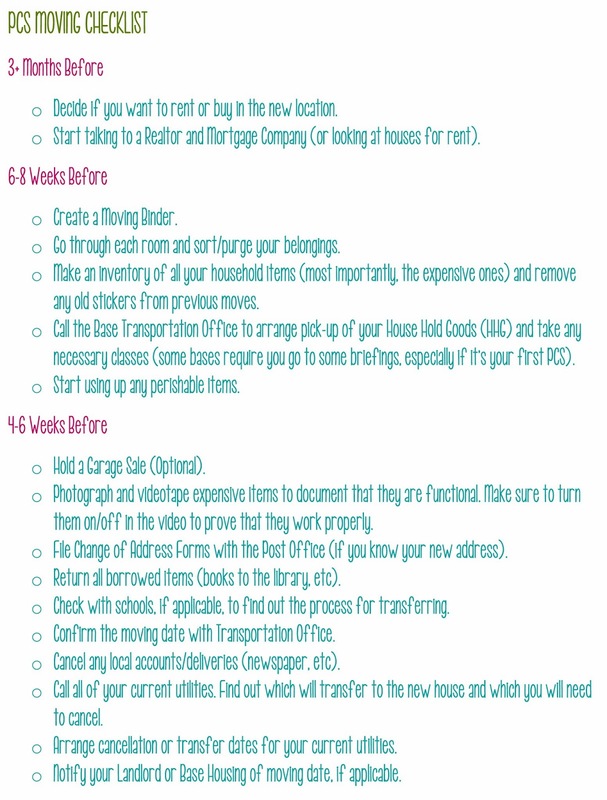 Begin packing early and only pack one room at a time. 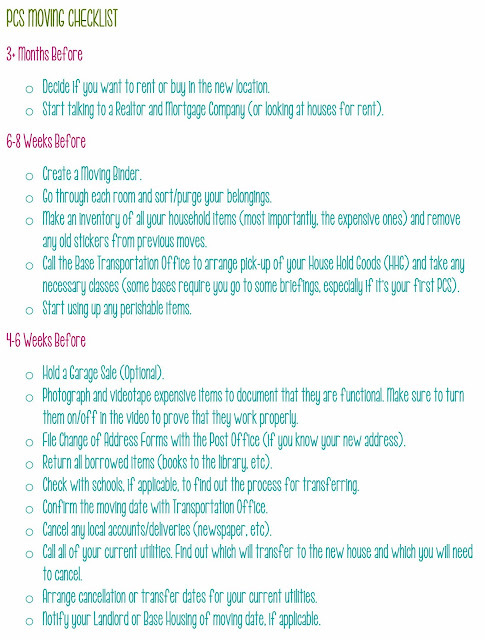 Start packing items that are not used frequently, such as books, out of season clothing, etc.